"....a powerful, Macdonald-esque meditation on the claims the past exerts on the present. Few mystery novelists make background facts and simple descriptions sing the way this writer does. And no writer exploits Los Angeles - its geography, its historical power wars, its celebrity culture, its lore - as compellingly as Connelly....he must be read." "If any novelist is worthy to walk once more through the front door of Raymond Chandler's iconic Sternwood mansion, it's Michael Connelly. For over two decades, Connelly has been brilliantly updating and enlarging the possibilities of the classic L.A. hard-boiled novel, first bestowed upon the world in 1939 with Chandler's debut, The Big Sleep. This latest Bosch outing is its own accomplishment: brooding and intricate, suspenseful and sad. In short, it's another terrific Michael Connelly mystery....a master of the genre." "Michael Connelly is the master of the universe in which he lives, and that is the sphere of crime thrillers. This man is so good at what he does.... 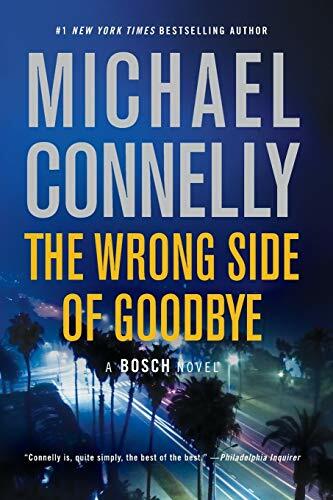 THE WRONG SIDE OF GOODBYE is the twenty first Harry Bosch story and it is just as good or better than the first one was. Nobody writes like Connelly, nobody. He is unique in his style and also in the character of Harry Bosch he has created. If you read one page about Harry Bosch as written by Michael Connelly you will be hooked for life." "It is impossible for Connelly to tell a bad story. Moving effortlessly between Bosch's private and public cases, he ratchets up the tension...pulling off in the final few chapters a California noir sleight of hand that would make Ross Macdonald envious." "....it is immensely satisfying to see Bosch's sustained and deepened passion for his mission- "Everybody count or nobody counts" - undiminished by age or circumstance, even as a younger generation of detectives of all colors and orientations share the stage to carry on the work that has given Bosch, and this series, such an enduring appeal. Harry Bosch and his law enforcement heirs are still fighting the good fight, luckily, for us all." "It is a disturbing and yet cathartic tale-within-a-tale that proves once again what a master storyteller Connelly is."